St. Mark Catholic Church, in conjunction with St. Callistus in Kane, held the Sacrament of Confirmation last Sunday at 1 p.m. in Kane. Congratulations to the candidates who were sealed with the Holy Spirit. 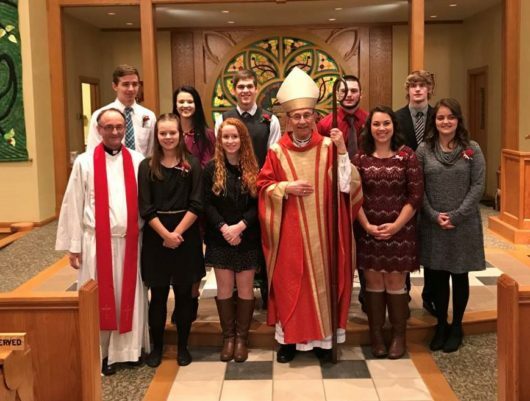 Shown, front row (l to r): Father Paul Siebert, Lexi Newton, Abigail Rowan, The Most Reverend Lawrence T. Persico, Bishop of Erie, Kira Aikens and Bobbi Fragale. Back row: Eric Morton, Shannon Crisp, Adam Shaffer, Jared Whiting and Nicholas Martuccio.